Conferenceseries LLC takes immense pleasure & feels honored in inviting the contributors across the globe to attend the “7th World Congress on Breast Cancer & Therapy” which will be held in May 25-26, 2018, Radisson Hotel JFK Airport, New York, USA. Target Spectators: We extend warm welcome to distinguished Physiology/Cancer/Oncology Nobel laureates, Speakers, Delegates, Exhibitors, Researchers, students around the world to explore the Knowledge in Breast Cancer and Therapy. Theme: This conference is organized around the theme “Discussing the Past, Present and Future Challenges in Breast Cancer & Therapy to Bring Awareness”, which covers a wide range of critically important sessions from basic research to latest innovations in the field of Breast Cancer Professionals. 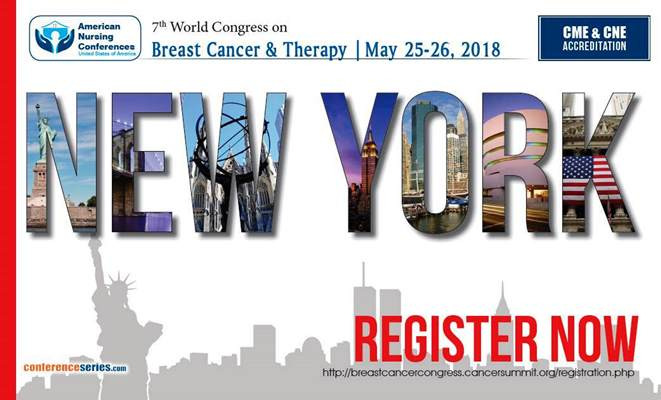 Conferenceseries LLC invites participants from all over the world to attend "7th World Congress on Breast Cancer & Therapy” during May 24-26, 2018, New York, USA which includes prompt keynote presentations, Oral talks, Poster presentations and Exhibitions. Conferenceseries LLC is a world class conference organizer, which have highly talented conference organizers around the globe. We have 70,000 editorial board members for journals and also 600+scientific conferences. We publish more than 700+ Open access journals for which we have more than 1 million readers and we strictly follow 21 day rapid review process. We endeavor to support and organize a variety of conferences throughout the year as educational opportunities to update knowledge and skills.